Today over at the IO Blog we are featuring some of our older stamps. I wanted to showcase this stamp in an up-to-date way because I just love it. We all have loads of stamps in our craft rooms that could use a little tweak to make the design on trend. 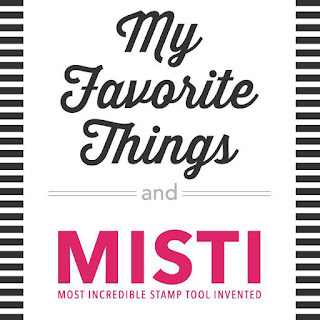 This IO stamp is actually a collage stamp - I adore them and have many that are -umm -15 years old or more! Instead of leaving it as just one layer, I cut out the main part of the image after I colored it in and put it on my own background. I used some Squeezed Lemonade Distress Oxide to make a background with a stencil and then added splatters of Sheer Shimmer and gold spray. 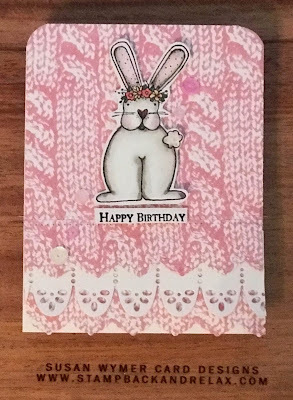 As I was using a no line coloring technique - I stamped the image with IO Stamps Fog Hybrid Ink using my MISTI. the IO Blog for more inspiration from the team! I am using compensated affiliate links at no further cost to you. I received the stamp as part of my design team work for Impression Obsession. Yesterday, I needed to make a winter card because sooooo many of my friends are surrounded by ice and snow! 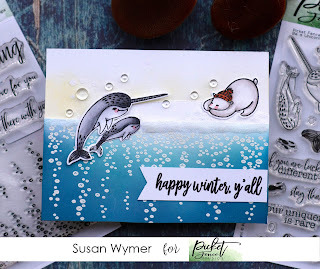 For this card, I decided to flip a Bottomless Sea to make an icy border for the narwhals and the polar bear to meet. Bottomless Sea is very versatile and could be used as a spring canopy too. I will eventually make that card. First, I used our Blender Brushes to make the sea with several shades of Distress Oxide Inks. I let that dry and then treated it with an anti-static tool. I then stamped the main image of Bottomless Sea with Versamark Ink and used White embossing powder. For the sky I blended a bit of Squeezed Lemonade onto the panel and then spritzed it with Sheer Shimmer spray. I die cut a hill from a generic landscape border set. I popped the bottomless sea panel onto the sky panel. Meanwhile, when I returned from running errands lol - I colored my critters which I had stamped with PFS Hybrid Black ink. I used 2 narwhals from Be a Unicorn of The Sea with N0, N1, N3, and Copic Markers. For my polar bear from A Bear Kind of Winter I used W00, W1, W3 and a smidge (I always say that) of W5. I used R32 and R35 for the hat. Every critter got a coating of clear Wink of Stella! The sentiment is from A Gnome Winter. Y'all why use 1 stamp set when you can use 4???? I stamped it in Versafine Onyx Black Ink. I cut it into a banner and popped it on the card. And I called it done because I want to get back to Spring lol - well until my friends are under another foot of snow lol! 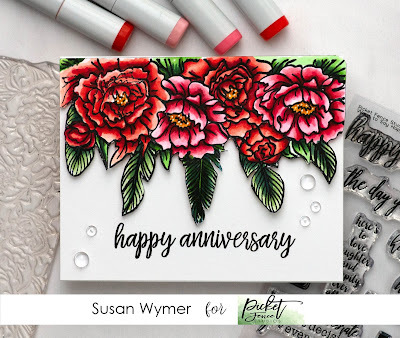 Hi, We have a new challenge starting over at the Impression Obsession blog - HERE. 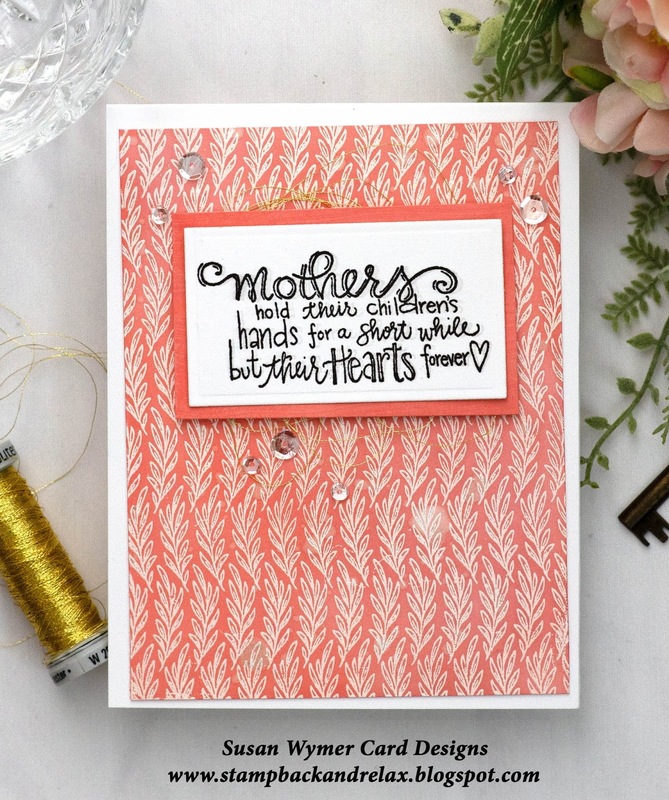 Make a card all about love and link it up to the challenge and enter to win a gift certificate to the store!!! Today, I decided to use Elmer Loves Ellie - you see them above - and doesn't he look dapper in his pin stripe shirt??? The flowers are from Wispy Cosmos. I stamped all images with IO Black Hybrid Ink and did some copic coloring. I die cut the grass with our grass border die from some stock green paper. I made the background by blending Squeezed Lemonade, Worn Lipstick and Picked Raspberries. I then added some water droplets and let them set a few seconds. I blotted them up with a dry cloth. I also splatted the background with Sheer Shimmer Spray. For finishing touches, I added clear sequins and Glossy Accents to the flower centers and the banner. I just had to use my clear Wink of Stella pen on her dress and the flowers. Thanks for stopping by. I hope to see your cards linked up to the challenge! I am using compensated affiliate links at no further charge to you. I received the Wispy Cosmos set as part of my design team work. 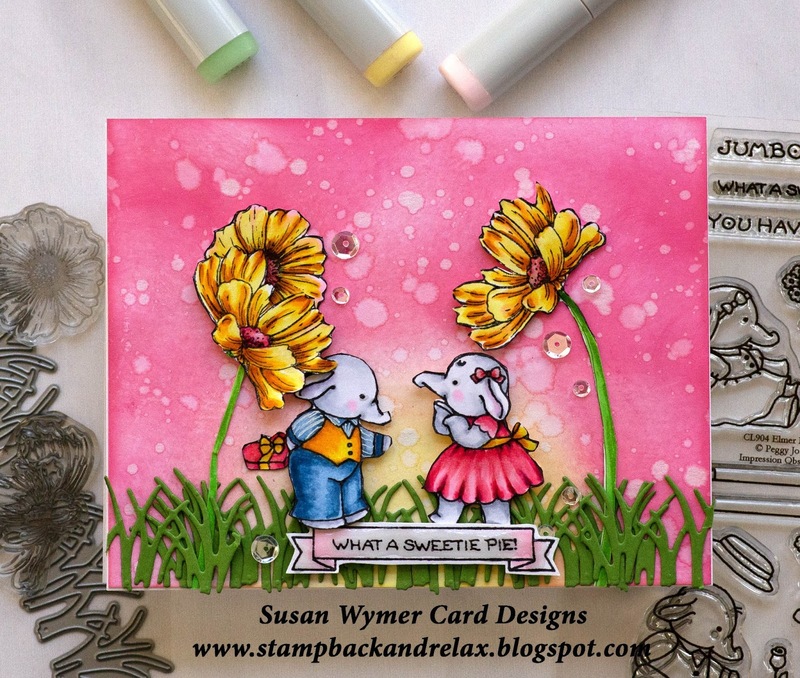 Hi, Today I am up on the My Sweet Petunia blog for Team Tuesdays. I have obtained the newest tool - the Cut Align - it is fantastic. I have trouble cutting small strips and the Cut Align makes this so easy. I also have a card featuring the new Picket Fence Studios Aeonium African Succulent. Hi! Today at Impression Obsession we are having a feature on our dies. I used Leafy Background to create a tone on tone card. I sprayed the base with some Shimmer Spray. I left some of the leaves not adhered to the base as I wanted it to look lacy and not perfect because that made sense with the sentiment. I stamped the sentiment with IO Black Hybrid Ink. The sentiment is from Fred Said - best sentiment set ever!! 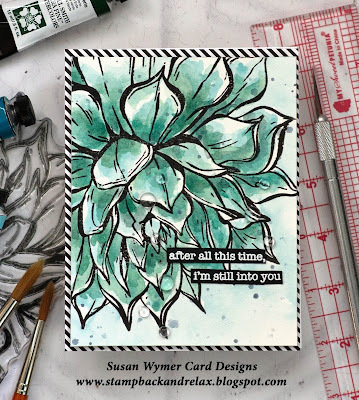 I used the new Cut Align tool from My Sweet Petunia to make the matted sentiment. I then added some pretty blue sequins from Neat and Tangled! Products Used: I am using affiliate links at no further cost to you. I received the background and sentiment from IO as part of my design team work! I think this set Dani Girl and her dragon is my favorite of the release! I colored her with rainbow hair to match her rainbow dragon. In the background is our new sun burst stencil. 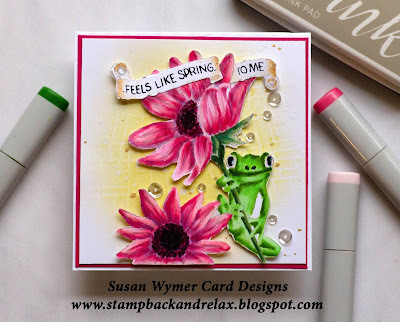 I added some Squeezed Lemonade Distress Oxide ink to embossing paste and embossed through the stencil. 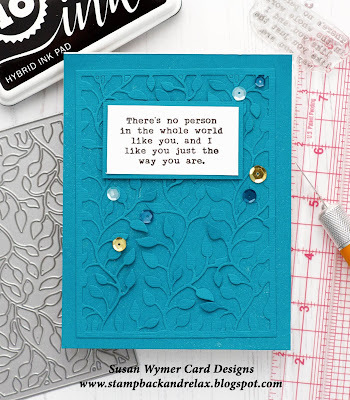 For extra sparkle I added Hero Arts Sparkle Glitter embossing powder. 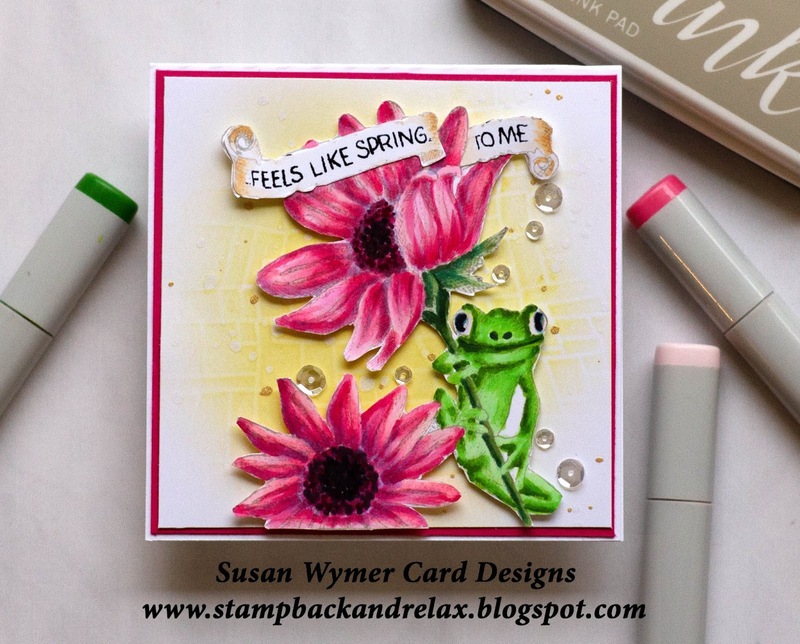 I waited for the paste to dry before heat setting the embossing paste. This prevents bubbles from appearing in your embossed areas. I then added some gems from Pretty Pink Posh! 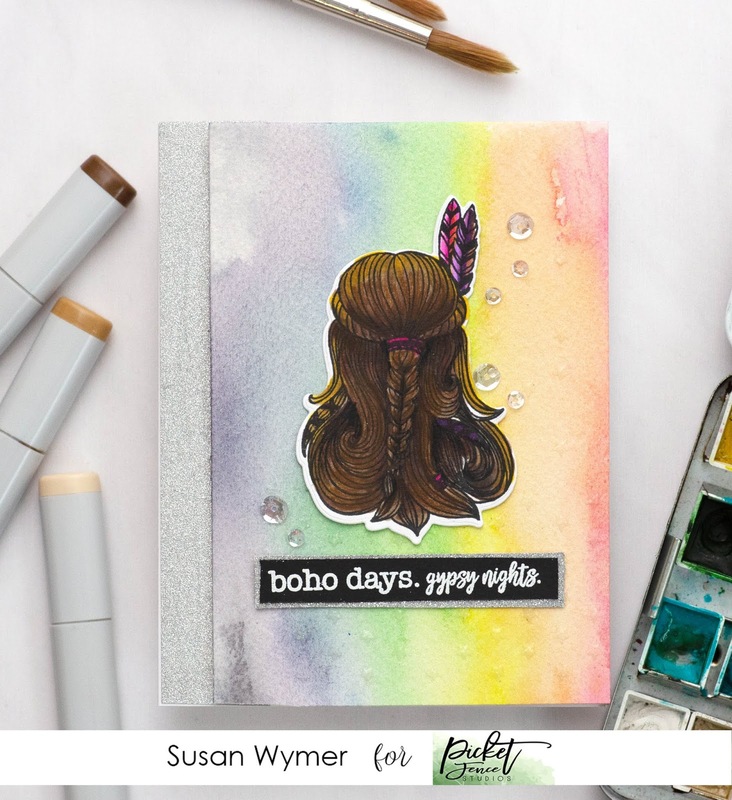 Next up is my card featuring Boho Gypsy. I really enjoyed coloring her and tried to add a glow around her face from the rainbow in the background. I created the rainbow by adding some stripes of watercolor. 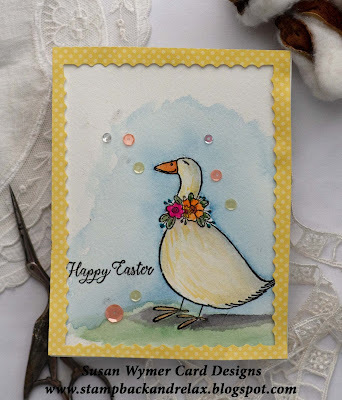 I spritzed the paper with Sheer Shimmer spray and added a few droplets from Pretty Pink Posh. I am using compensated affiliate links at no further cost to you. I received the stamps and dies as part of my design team work for Picket Fence. For this card which has bohemian feathers dripping from the flowers - which are beautiful - but I wanted to go with a more traditional look to show that you can take a stamp set to where ever you want to go with it! I inked this carefully with Memento Tuxedo black in and colored it in with reds and red-violet Copic Markers. I then fussy cut the image which removed the feathers. 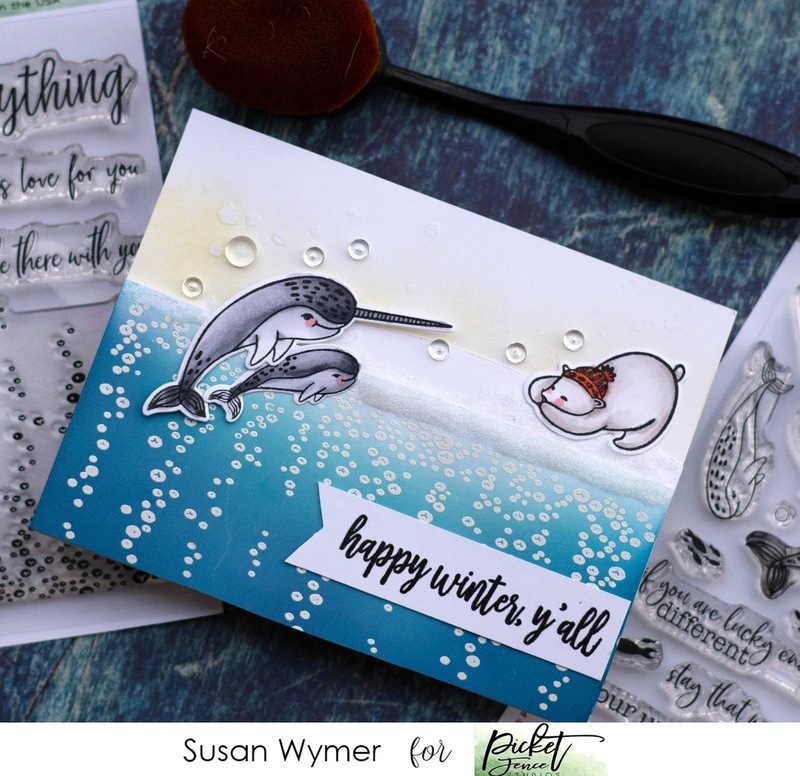 I stamped the sentiment with Versafine Onyx Black and added some droplets! So easy! My next card features a new set of critters. 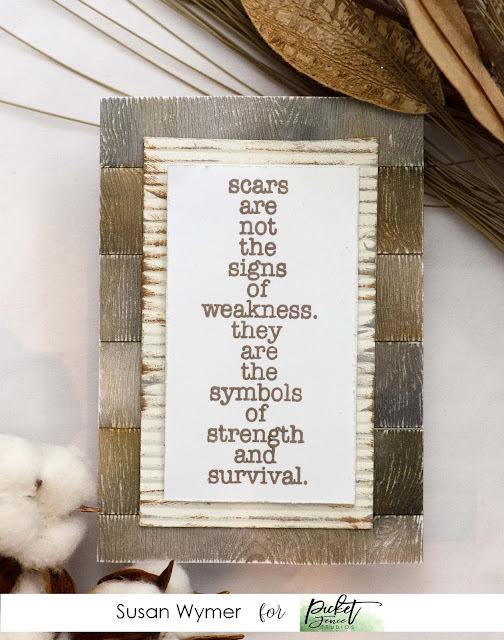 These also have Bohemian elements added to them. 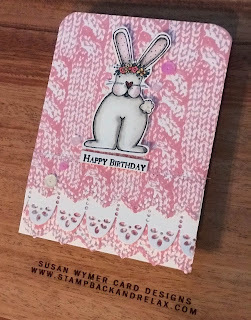 However, I decided again to go a more traditional route - a shaker card. I CASEd the design from Debby Hughes. 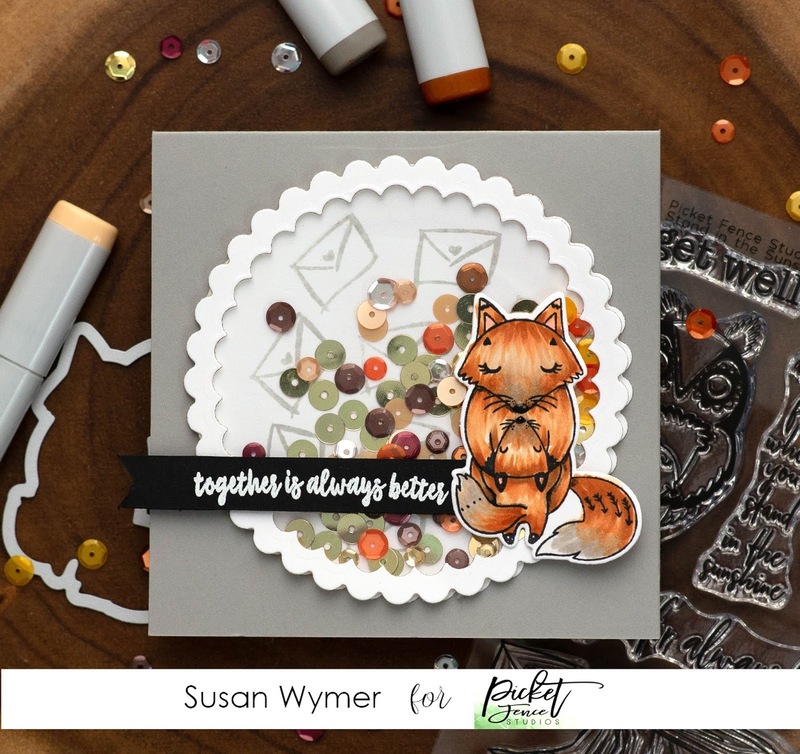 I love the family oriented sentiments that PFS has so I added a sentiment strip next to my mother and child fox image. Products Used: I am using compensated affiliate links at no further cost to you. I received the stamps and dies as part of my design team work for Picket Fence Studios. 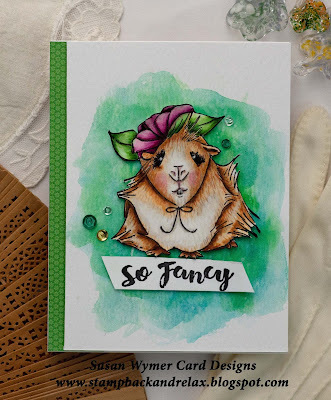 Welcome to my blog and the My Sweet Petunia/MISTI collaboration! I have been to the MFT store in Eustis, FL. It is beautiful and they have lots of MISTIs! So if you live nearby you can shop our products and theirs at one stop. Speaking of product: THERE IS A GIVEAWAY!!! My Sweet Petunia MISTI is giving away 3 $50 gift certificates and MFT is giving away 3 $25 gift certificates. To enter leave a comment on my post and on every post in the hop. The main list of participants is at the MISTI and MFT blogs. Leave a comment on every poster's blog for more chances to win. Comments close Monday at 10PM. 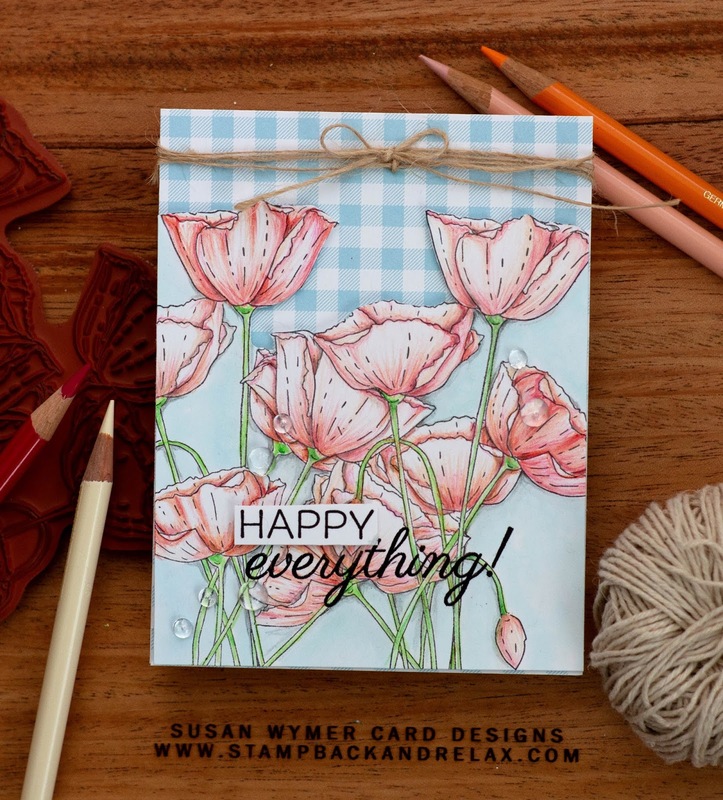 The winners of the My Sweet Petunia gift certificates will be announced Wednesday on the MSP blog and the winners of the My Favorite Things gift certificates will be announced Wednesday on their blog! 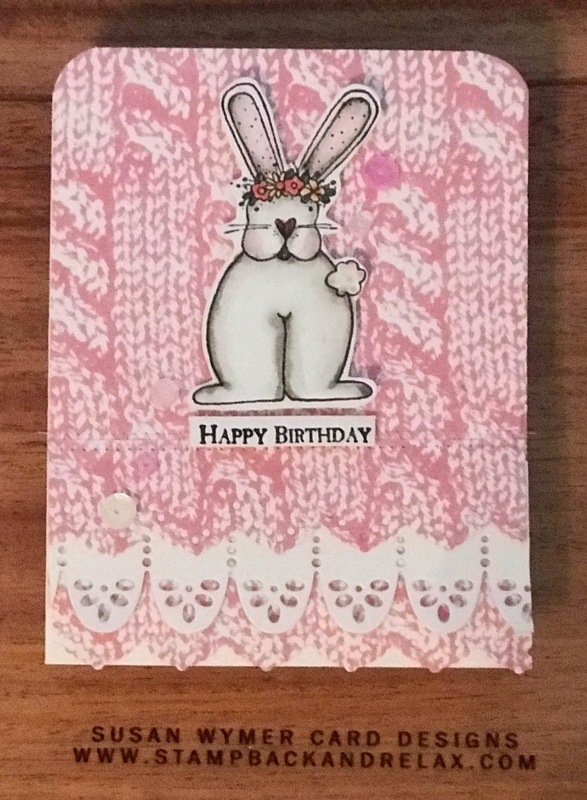 So I did not make a card! 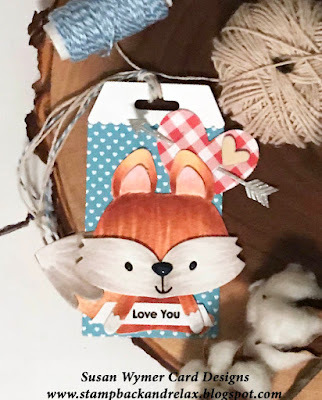 Shocking but I made a tag for my little grandson using MFT's Friendly Fox Dynamics die! I die cut the image using Neenah Solar White 80 lb card stock and colored it in using various Copics. I die cut the tag from paper in the Sweet Treat Stack from MFT. The heart was die cut from a gingham stack from MFT as well. I used my MISTI to stamp a sentiment from Sweet Celebrations and tugged a sentiment strip right under his cute little arms. It was so easy. For the My Sweet Petunia list go HERE. 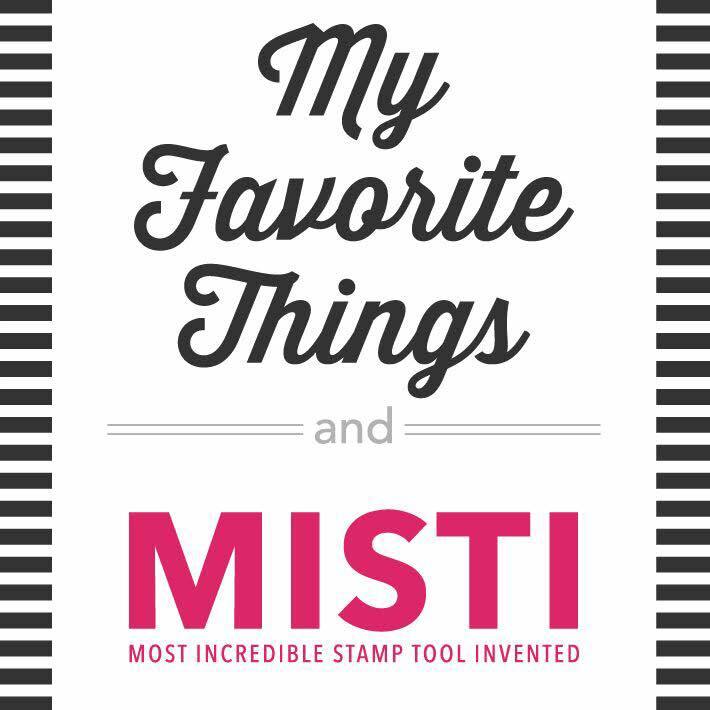 For the My Favorite Things list go HERE. Hop to each and every blog to comment for a chance to win. Products Used: I am using compensated affiliate links at no further cost to you. I was given the products used in this post as part of my design team work for My Sweet Petunia. The Impression Obsession Spring Release Celebration starts today and goes all week long (January 7th-11th). Every day you can find a list of participants on the Impression Obsession Blog at 6am. 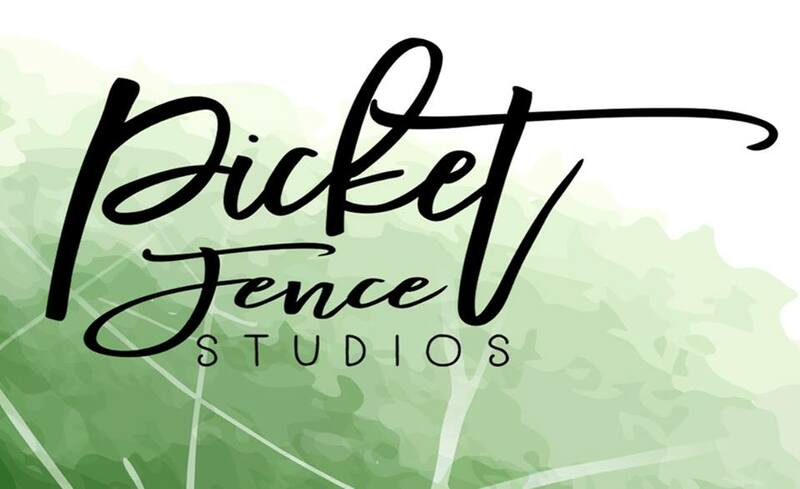 Every single blog will have a $25 gift certificate to give away for the event - so the more you comment through the week the more chances to win! All comments for all of the event days will be open until Sunday January 13th at noon CT. All winner will be announced on Monday January 14th. All of the new stamps are available now! You can find them HERE. 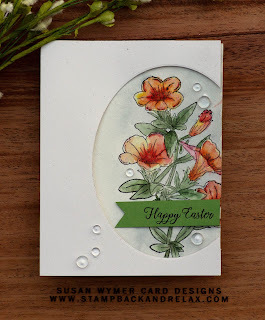 My first card uses the new Petunia Sprig floral. I stamped this in Versafine Onyx Black ink onto Arches Cold Press 140 lb watercolor paper and used my various watercolors to color it in. I then side die cut an oval from some oatmeal card stock. I mounted the watercolor panel onto the card front with foam adhesive and added some clear droplets. 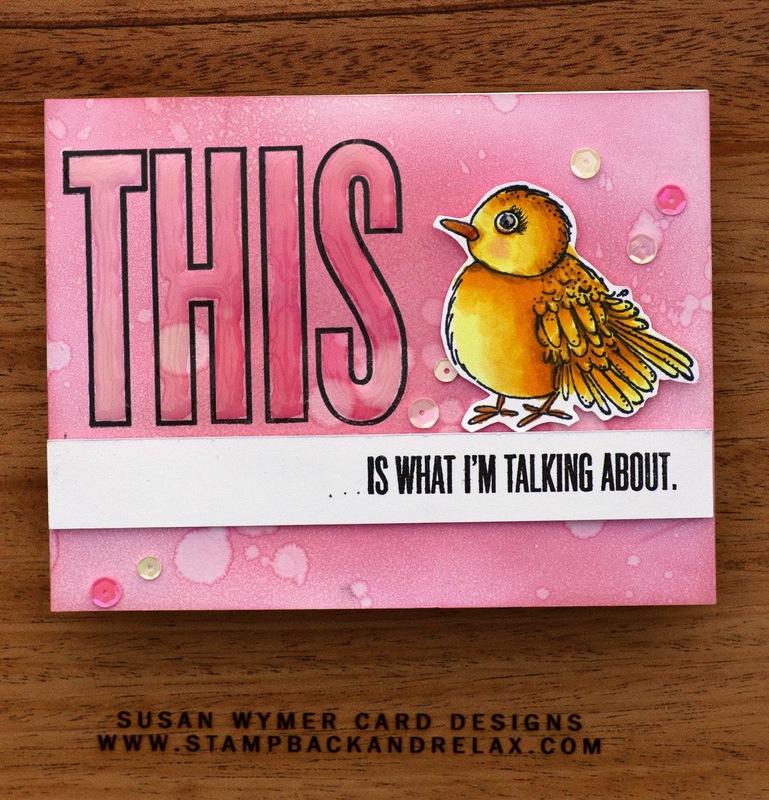 For my next card, I used an older stamp set - THIS - paired with our new Birdie image. I created a Distress Oxide background using my blender brushes with Worn Lipstick and Picked Raspberry. I then splattered this with water and Shimmer Spray. 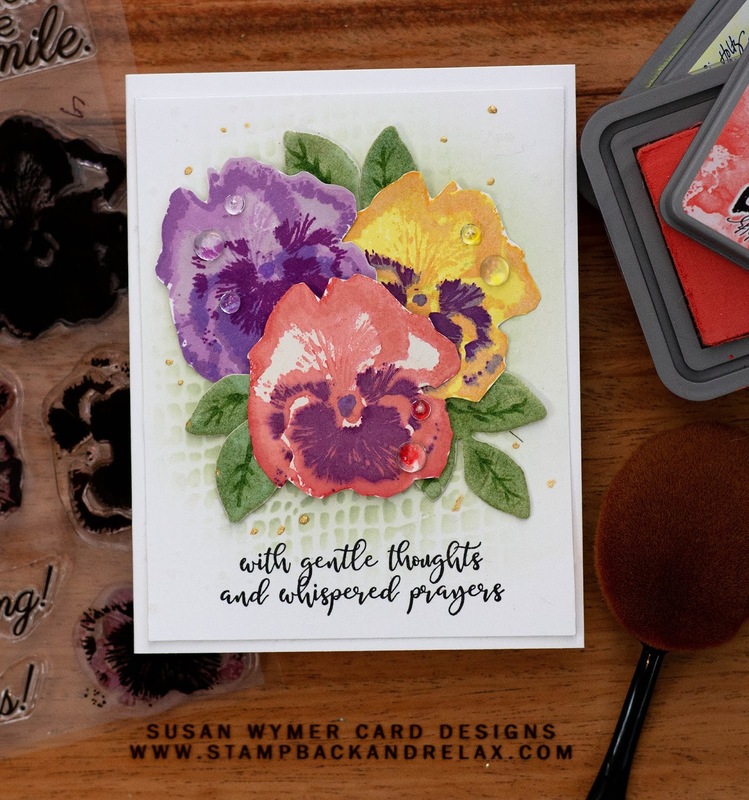 I stamped the sentiments with Versafine Onyx Black ink. I stamped Birdie onto Neenah Solar White 80 lb card stock and colored it in with various shades of yellow Copics and YR27. I did add some colored pencil detail lines. I then filled in the THIS with clear Wink of Stella and Nuvo Deluxe Glaze. Thank you for stopping by! Please leave a comment to enter the contest for the $25 gift certificate I have to give away!!! I am using compensated affiliate links at no further cost to you. I received the stamps as part of my design team work. Today is a critter day! We have so many cute bunny and Easter images. I also used our cable knit sweater background. This was so easy to make. I stamped the background in pink onto Neenah 80 lb cardstock. I die cut some of the sweater with our Border Duo 1 set. I added Bun Bun and and a sentiment! That was it! Products Used: I am using compensated affiliate links at no further cost to you. I received the stamps for my work on the design team. Today is yet another floral day for me. This release has some gorgeous florals and amazing background stamps. Here is my first card. 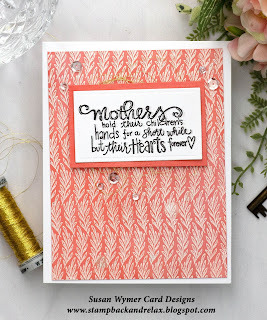 I used the background stamp Branches and white heat embossed it. Then using my blender brushes I added Worn Lipstick and Abandoned Coral Distress Oxide inks. I then splattered the panel with shimmer spray. 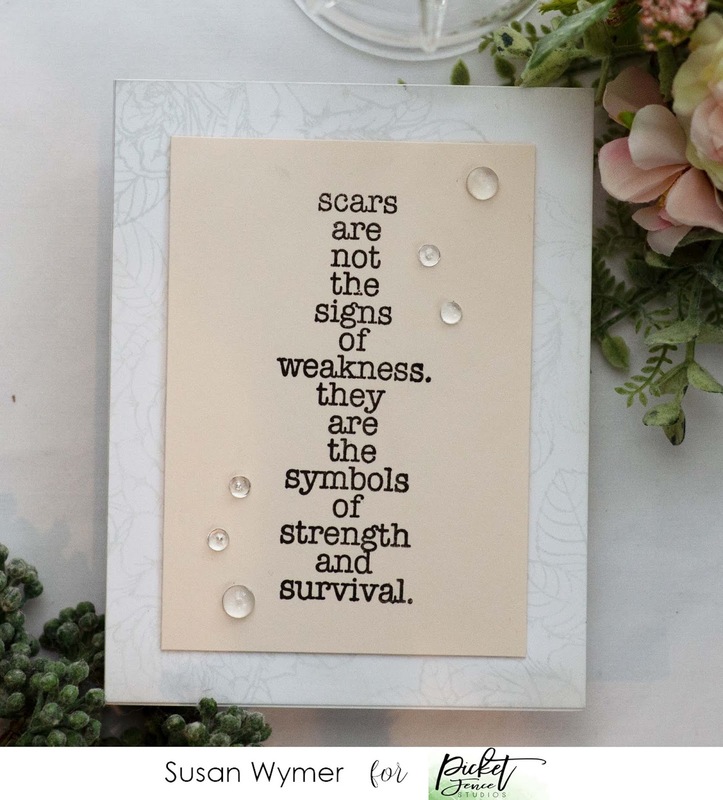 I stamped the sentiment with Versafine Onyx Black ink onto a white panel. I think inked up another panel with Abandoned Coral Distress Oxide to make a coordinating mat. I did heat set this before using it. I then added a little gold thread nest and some crystal dots and it was done. 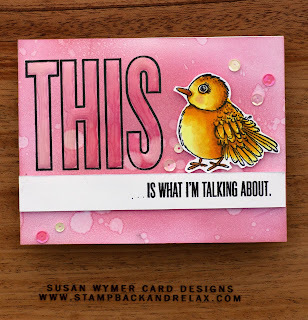 This next card uses the Feathered Tulip set along with a sentiment from Fred Said. I kept this one simple and just added a bit of grey ink using a stencil for the background. I copic colored the flower and butterfly. Products Used: I am using compensated affiliate links at no further cost to you. I received the stamps from Impression Obsession as part of my design team work. Today is floral day for me - ok - we all know there will be more florals coming! Here is the first card using Poppy Field. This was so easy to make. This is a large stamp so I could have easily made a 5 x 5 card. I simply stamped it in Memento Tuxedo black and colored it in with some very inexpensive colored pencils that I share with my granddaughter. I had planned on using Copics but I was traveling so kid pencils it was. When I got home I colored the field with Copic Sketch B0000 and then added the sentiment. I trimmed around the flowers and mounted it on a gingham panel. The next card also came together easily. 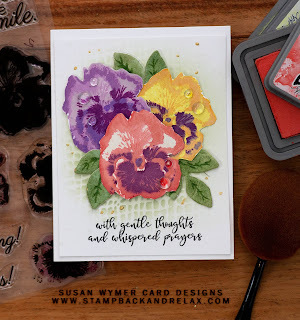 I stamped the 5 layers of this gorgeous petunia in various Distress Oxides and Colorbox Alabaster Chalk Ink. I used that as the first layer of the front petunia and I am particularly pleased with that one. Thanks for stopping by and please leave a comment to enter the drawing for the $25 gift certificate! Products Used: I am using compensated affiliate links at no further cost to you. I received the stamps for my design team work for Impression Obsession. 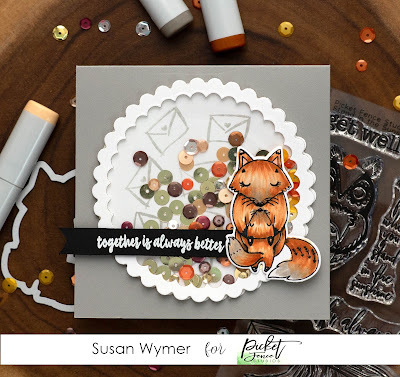 This is such a great release - so many gorgeous florals, a Mr. Rodgers sentiment set and a bevy of adorable critters. Today is a critter day for me. I have two cards. The first uses Mother Goose! I used this image to make an Easter card. I stamped the image using Versafine Onyx Black ink onto Arches 140 lb cold press paper and painted the image with my water colors. I then die cut the frame from our 6 in 1 Frames die. Supplies are linked at the end of the post. Next up, I have our Guinea Pig in a Fascinator - my favorite. I colored her with Copics and colored pencils and had soooooo much fun. Products Used: I am using compensated affiliate links at no further cost to you. 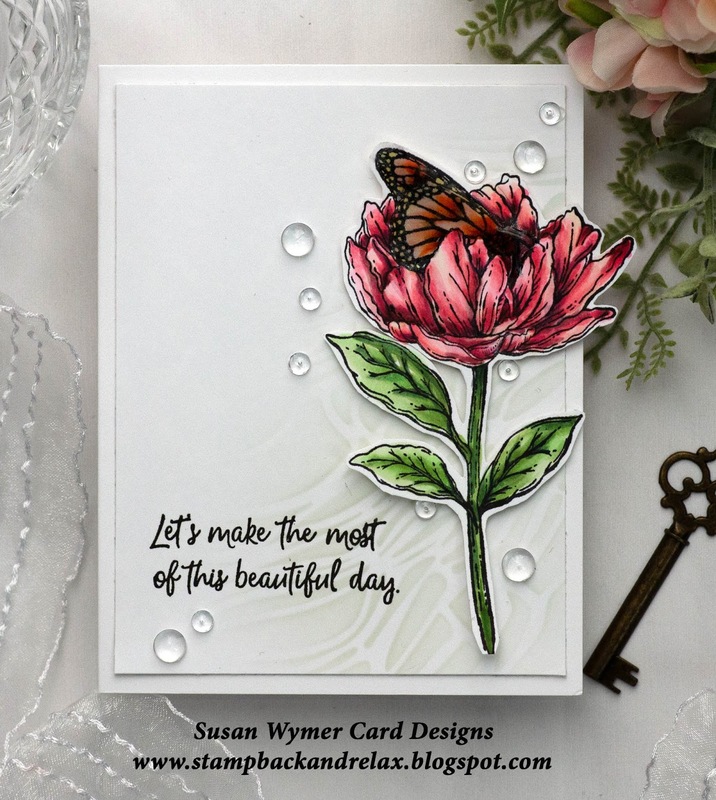 I received the stamps used in this post for free for my design team work for Impression Obsession. 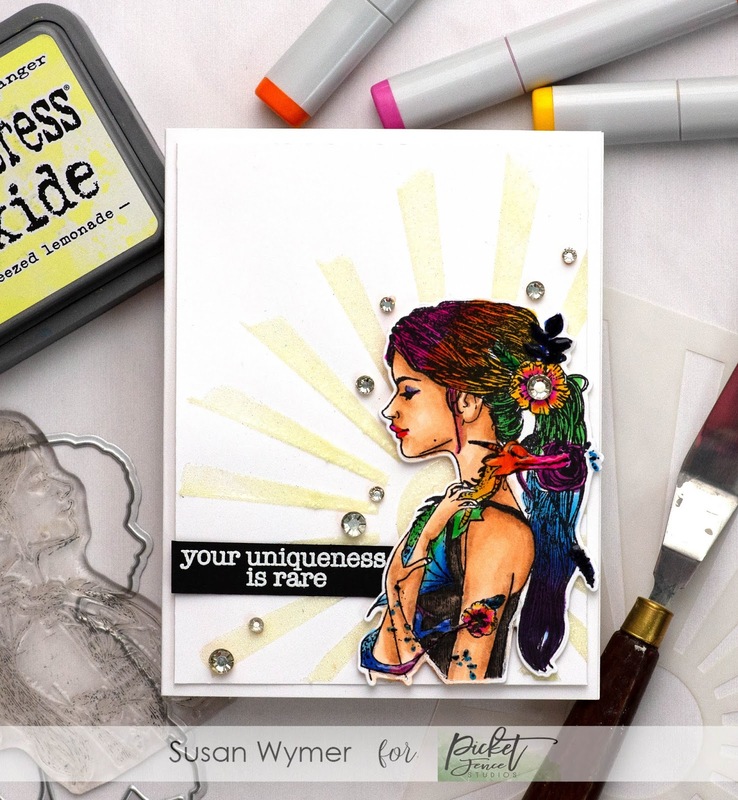 To kick off the New Year, Impression Obsession has a challenge going on over at the blog - make a card to celebrate a new beginning of any kind! Today I have a wedding card for you. 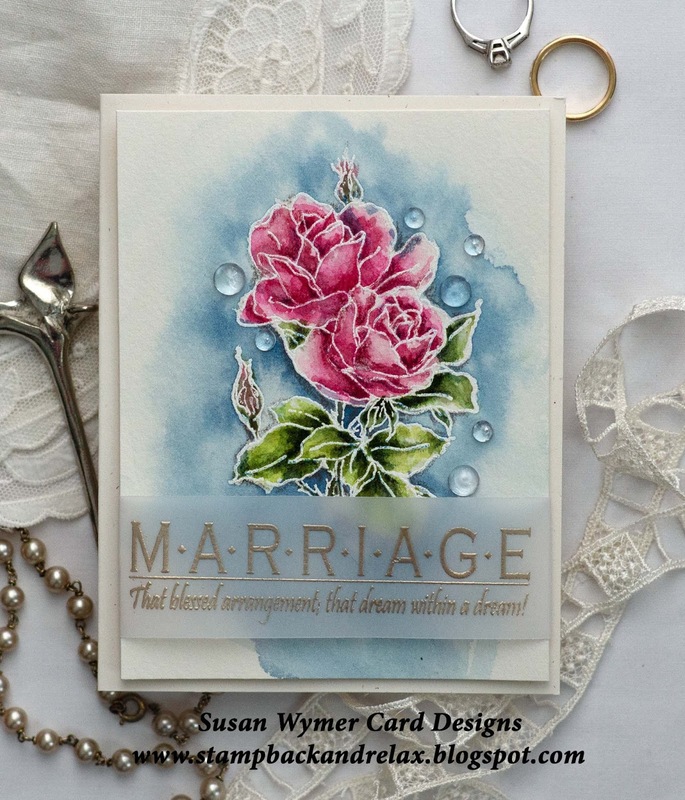 I used two older sets to make this card - Beauty Roses and A Good Marriage. 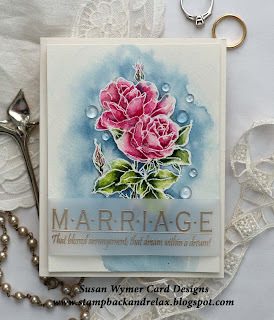 First, I embossed the floral image with white embossing powder onto Arches 140 lb cold pressed watercolor paper. I then used several different colors of Daniel Smith Watercolor paints and some colored pencils. I,then, heat embossed the sentiment in Ranger Liquid Platinum onto Bazzill Heavy Weight Vellum. I adhered this as a band with the adhesive in the back. I popped up the panel onto an oatmeal card stock side folding card. Thank you for coming by! Don't forget to link up your card to the Impression Obsession challenge post to enter for a $25 to use in the IO store!!! Products Used: I am using compensated affiliate links at no further cost to you.